Uphill Athlete’s founders Scott Johnston and Steve House have decades of legendary climbing experience between them that they now use to help mountaineers conquer the world’s highest peaks and most adventurous ascensions. Since they began coaching they have developed a number of science-backed methodologies on the best strength and endurance training and nutrition regimens that have helped the world’s best climbers push themselves to limits once thought impossible. Uphill Athlete’s endurance training plans help endurance athletes do everything from get base strength and fitness for the rock-alpinist season and mountain running to climbing some of the world’s most famous mountains and lengthiest high-altitude treks. 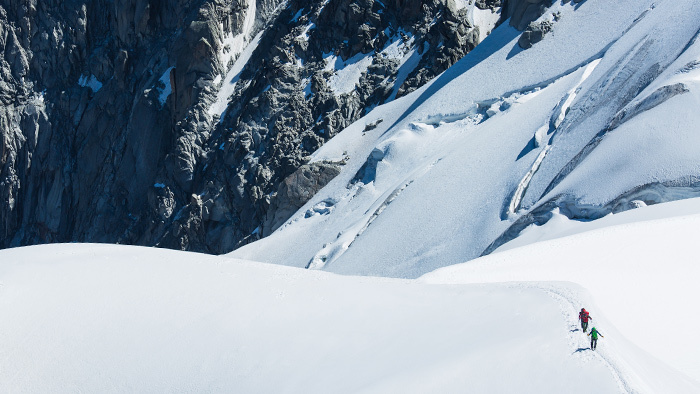 We sat down with Scott Johnston to discuss how they used a “low-intensity training plan” for climber David Göttler, including during his recent expedition to set a new route up the South face of the mountain Shishapangma. Shishapangma is an 8,000-meter peak that sits entirely inside of Tibet and was the site of the fatal avalanche in 1999 that claimed the life of legendary climber Alex Lowe. In fact, it was during a Shishapangma trip in 2016 that Göttler and his climbing partner, Ueli Steck, recovered the remains of Lowe. Sadly, Steck was killed in a climbing accident near Mt. Everest earlier this year. When David Göttler first came to you, he was looking to reach a new level of fitness and climb with legendary climber Ueli Steck. When you take on a client like this, one who has a very high level of fitness but done with a very different training methodology than you use, how do you successfully indoctrinate them into the “low-intensity training” approach? Ueli’s training methodology was virtually identical to the methods that David employed. The real difference was where each was long their development progression. Ueli was just several years more adapted then David was. Training should always be individualized to the needs of the athlete. David was aerobically deficient when he started with me. So step number one was to reduce that deficit. With only that one focus he made huge gains and during his and Ueli’s 2016 climb of Shishapangma, he was able to climb as an equal partner with Ueli. During many of their numerous training sessions together I heard from both of them that the gap between them continued to close in almost every respect. The critical difference was that Ueli had a higher tolerance for risk than does David. A classic mistake often made by endurance athletes is to try to emulate the training of an elite in their sport. When he started with me there was no way David could have trained with Ueli. And to do so would have resulted him becoming over trained within a few weeks. The impressive workouts, races, climbs that any top athlete performs—be it Kilian Jornet, Ueli Steck, or Mo Farrah—is not due to those feats, it is due to the years and years of unglamorous training they have done to get to that performance point. Sadly this fact is poorly understood in the rush to emulate. Do you have your mountaineers do any high-intensity work at all? Yes, absolutely. When it is appropriate; meaning when they have the aerobic support to enable it to benefit them. However, their high intensity training is not going to look like the high-intensity training of a track athlete or even of an IRONMAN triathlete. By high intensity what you really mean is event-specific endurance training. This is training that specifically models the demands of the athlete’s event. That event-specific training is going to look different depending on the demands of the event. Just as a 1,500m runner’s event-specific work will necessarily be quite different than a marathoners, an 8,000m climber has different demands for his event that need specific training. There is a great deal of misinformation out there about appropriate training methods for endurance, which means we have to do some education. We do this in our book and on our website. I have considerable success with training conventional sports athletes at the Olympic and World Championship level and applying those same methods to climbers. We can show them our track record, which simply speaks for itself. You have said that TrainingPeaks allows you to justify your training philosophy to your athletes in real time as they complete their goals. Can you speak to this a little more? We use the CTL and TSS metrics to track our athlete’s progress. We have developed some workarounds that help us adapt these metrics to our needs, because they were intended for conventional endurance sports. In the end we can show them that CTL is still a very good proxy for fitness. What types of data feedback are you looking for in your athletes as they prepare for a final ascent that tells you they are ready? We use CTL, but we also evaluate the total hours spent training. We use rates of climb in a similar way that it might be used to indicate a cyclist’s power. As we collect more of a database we are exploring using some more specific targets that will reflect the athlete’s preparedness state. These are imperfect, but useful benchmarks. Most of our users are looking at training for endurance events at sea level. At Uphill Athlete, how do you use Chronic Training Load (Fitness), ATL (Fatigue) and TSB (Form) to calculate your athlete’s ability to climb the largest mountains in the world? The limited oxygen supply at high altitude plays a huge role in determining the pace a climber can sustain. What we know is that the higher the basic aerobic capacity represented by the speed at the aerobic (as opposed to the anaerobic) threshold (AeT) is the best predictor of success at climbing at high altitude. This is because the lack of oxygen precludes the athlete’s ability to perform any high intensity exercise, so standard measures of endurance performance such as FTP or anaerobic threshold play almost no part in this environment. While it is true that those with high a high FTP may also have a high basic aerobic capacity (high AeT), it is that high AeT that is supporting the high FTP and not the other way around. High altitude climbers are limited to using their most highly aerobically adapted muscle fibers, which happen to be the slow twitch fibers. These fibers’ aerobic capacity is best improved with long duration, low-to-moderate intensity exercise. For many endurance athletes, doing the vast majority of their training at a low intensity can be hard mentally—it can get boring—not to mention it is tempting to try and keep up with others around them. Is this an issue with climbers as well? Yes it is true, but like the best professional endurance athletes in conventional sports, there is no way around this. The aerobic base building requires high volumes of low intensity training. Pro cyclists train prodigious volumes of low-to-moderate intensities and elite marathoners run 100+ miles/week. The same phenomenon can and has been demonstrated across the full spectrum of conventional endurance sports. One of the more illuminating metadata studies was by Stephen Seiler and examined the actual training logs of the some of the best in the world in sports such as cycling, running, cross country skiing, swimming and rowing to find that about 85 percent of the average annual training volume was done below the athlete’s aerobic threshold. Matt Fitzgerald has written a popular book based on Seiler’s results. There is no shortcut to building the aerobic base. If there was a high-intensity short cut, then the best in the world would be using it. Learn how to more effectively train for your mountain sports from climbing and SkiMo Racing to Ultra mountain running with Steve House and Scott Johnston’s TrainingPeaks University Mountain Performance Workshop.